Two people were taken to hospital following a car crash in Peterborough on Friday night. 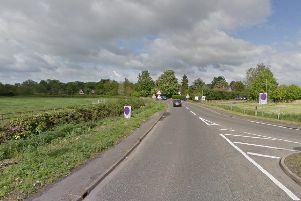 Police, fire and ambulance crews were called to the Thorpe Wood roundabout at 9.13pm on Friday, August 25 to the crash involving a white Renault Clio and silver BMW. Fire crews from Dogsthorpe, Stanground and the Peterborough Volunteers Fire Brigade used specialist cutting equipment to remove the roof of a car and extricate a woman who was suffering from a spinal injury. A 22-year-old female was taken to Peterborough City Hospital with suspected spinal injuries and breathing difficulties. A man was also taken to Peterborough City Hospital with neck pain. The A47 slip roads off the roundabout were closed while the vehicles were recovered and were reopened at about 11pm.